Metal dice are my RPG weapons of choice, specifically the Dwarven Metal series from Crystal Caste. Metal dice roll smoothly without bouncing across a table like a Chihuahua on meth and lend a certain level of posh to my gaming activities. A major downside is they damage soft surfaces if thrown with any aggression or dropped by a clumsy gamer. 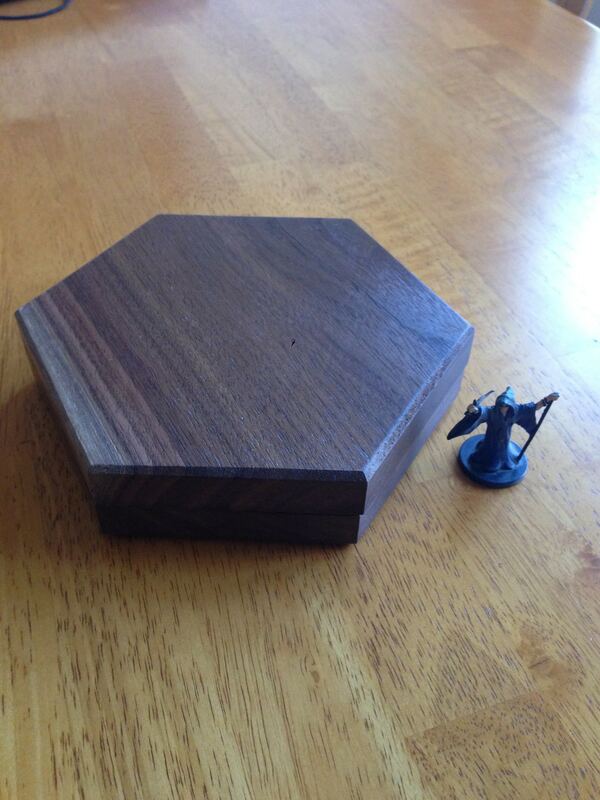 In deference to dining room tables and marriages of those I play with, I use a dice tray. 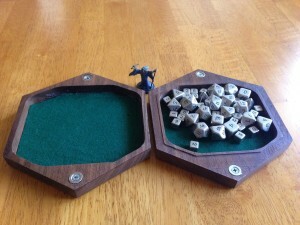 It works well, but I wanted something a bit more portable and that could hold my dice. 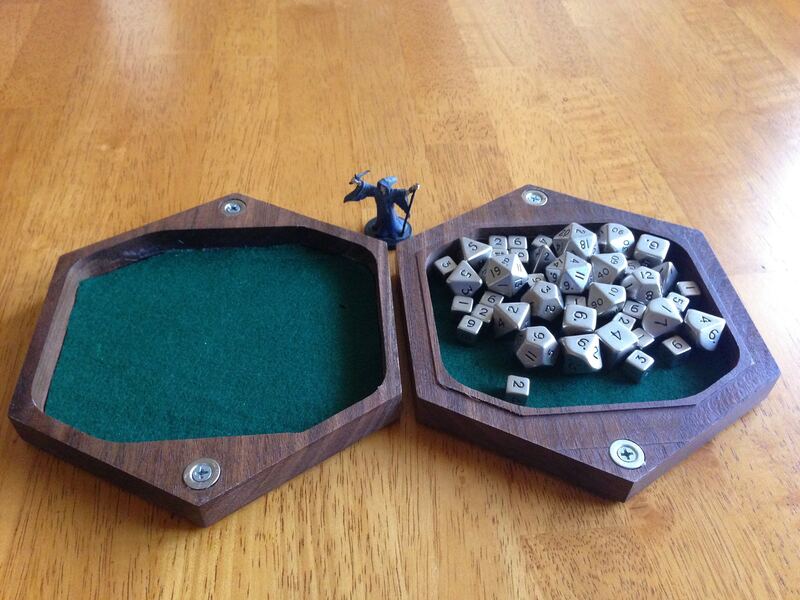 Gen Con 2015 provided a solution in the form of “Hrothgar’s Hoard Bard” magnetic dice storage tray. The miniature is a standard 25 mm D& D miniature for scale. The box is 6.5 inches (17 mm) at its widest point and 1.5 inches (35 mm) high. My version of the bard comes in a dark oak wood. This is the natural wood color as the only stain used was some oil and beeswax to bring out the grain. Other wood types were on offer, including something called Zebrawood, but I went with the traditional oak. Note the screws at the top and bottom of the box. These hold in place strong magnets that keep the box securely closed. I bought the box and after using it a few times at the convention realized I was a complete idiot. Every time I wanted to open it, I dug my nails into the seam between the two halves and pulled it open like ripping the top off of a cereal box. This resulted in the occasional cascade of dice on the table. The idiot part comes in when I remembered that magnets have terrible shear strength (side to side motion). Observe the correct way to open this box. My Bard held together in my backpack with no issue and successfully contained my dice as well as providing a felty green surface to roll upon. Most importantly it is a fraction of the size of my old model and weighs far less. The lack of decoration was an option I chose because I have dark and evil plans to have someone do custom carving on the box or perhaps laser etch eldritch symbols upon it. That said, there were some that had decorations done “at the factory” that looked nice, but I did not grab a picture of one. Apologies. My only issue and it is a small one, is the lack of a “key” or notch to tell which magnet is positive or negative. If you put the wrong magnets together they push apart. Not a major deal to spin the lid around but some kind of marking would be nice. Bottom line is I love my Bard and will carry it for years to comes. I think it is one of the most useful items I ever purchased at Gen Con and at a reasonable $45.00 I consider it a bargain both for its utility and quality. Sadly, if you are still reading this post then you might want to buy a Bard, but they are not for sale yet. Hrothgar’s Hoard had a flyer out indicating the Bard and a smaller version called the Monk will be part of a Kickstarter in October 2015. I also could not find either item on their website, but I will drop them a line and update this post with links as soon as they go on sale or the Kickstarter launches. Update: The kickstarter is online. Disclosure: I paid full retail for this item and have no relationship with the manufacturer. Nexus Games Bankrupt and Liquidating? July 30, 2011 trask Comments Off on Nexus Games Bankrupt and Liquidating?